Alexandra had originally been a Princess of Hesse and was raised in both the Hessian capital of Darmstadt and in England with her Grandmother, Queen Victoria. The Empress's brother Ernst-Ludwig became Grand Duke of Hesse on the death of their father. Ernst-Ludwig was interested in all of the arts and attempted to make his Darmstadt a global center for the development of modern art. The Grand Duke established the Darmstadt "Artist's Colony" where the decorative and building arts were broguht together in a world's fair type of environment - but without blatant commercialism. The greatest artists of the time took part in the exhibitions, including Peter Behrens and other leaders in the development of the then "modern style' which was called Jugendstil in Germanic countries and Art Noveau in the USA, England and France. In Russia it was called the "Style Moderne". This movement found fertile soil of Darmstadt from the encouragement of the Grand Duke and a splendid complex of buildings and pavillions at the Artist's Colony. The exhibitions there included actual model homes in Jugendstil style, in which everything right down to the silverware was designed by famous artists like Behrens. Nicholas and Alexandra visited these exhibitions and their visits were the occasion of gala receptions by the Hessians and much free publicity for the exhibitions. Alexandra liked modern things and she appreciated what she saw as they were conducted through the exhibition halls and around the model houses. She was very proud of her brother's accomplishment and the role of her native land in the encouragement of modern art. The Empress bought many things at the Artist's Colony - vases, material, furniture and such - although Nicholas himself detested the Art Nouveau style - especially in its' more extreme and austere manifestations. 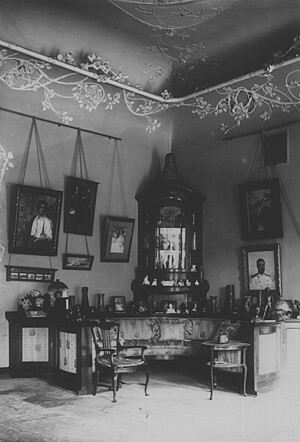 Above: Right side of the maple cabinet and couch, photo from the 1920's. Note the absence of the Empress's Fabergé Eggs from the cabinet. The painting of Nicholas is by Georges Becker. The pastel of Grand Duchess Maria on the upper left was done in 1903 by Fredrich von Kaulbach. Beneath her is another pastel by Kaulbach of Anastasia from the same year. Ernst-Ludwig was a frequent visitor to the Alexander Palace and he must have certainly given his sister a great deal of advice about decorating and entertaining. Alexandra admired her brother and was very close to him in temperment and inclination. After her husband, he was probably her closest and most trusted friend and confidente in the world. Ernst-Ludwig was one of the few people to whom she listened and she accepted advice from him. While accepting of Ernst's counsel, she bore a silent and grudging resistance to the recommendations of her much older sisters, which she often found to be condesending. 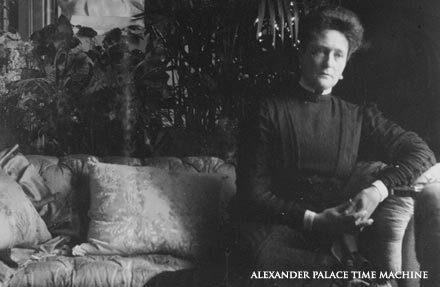 Her sister Elizabeth had spear-headed the redesign of the rooms of the Winter Palace in 1894-95 and the Empress always felt they were more her sister's style then her own. Nicholas and Alexandra made decisions about fabrics and rugs, but the layout and styles selected were the result of Elizabeth's ideas working directly with Roman Meltzer, the decorator. When Alexandra told Ernst-Ludwig in 1902 that she and the Emperor planned to expand their living space at the Alexander Palace and that she and Meltzer wanted to design the space in the Jugendstil style he must have felt pleasantly impressed and ready to assist. The plans were for two large rooms to be built on the main floor with more children's rooms above. One of the main rooms would be a comfortable sitting room for the Empress, and it came to be called the Maple Room, because of the lavish use of Maple wood througout the space. The Maple Room was a big, spacious and charming interior - full of light - which was probably the finest Art Nouveau interior in Russia. The walls were painted a warm dusty pink. 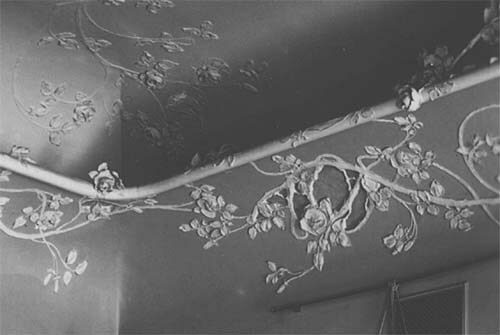 Ornamenting the walls were carved and moulded white-plaster trellises of German cabbage roses which climbed and entwined themselves about a pale green circle set in the center of a high ceiling. 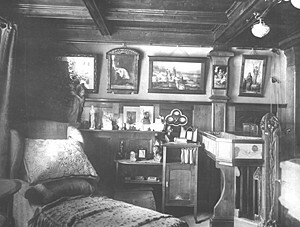 Around the room a high, overhanging curved cornice concealed hidden electric lamps which cast soft indirect reflected light over the room from the white ceiling; one of the earliest uses of what is now a commonplace lighting technique and was quite daring in its time. Above: Detail of the carved cornice. A piece of inset green glass can be seen behind plaster carvings. Light would shine through the glass. The carved plaster cabbage roses were skillfully duplicated in delicately carved wood on a great maplewood balcony which sailed across the entire room from one side to another. The balcony was curved at the top and was inset with leaded glass panels. Lacy bronze lamps with art glass shades hung like bats from its' supports. A staircase with sinuous carved railings lead from the right corner to the top of the balcony from which direct access to a mezzanine level over the corridor connected to Nicholas's New Study. Left: Alexandra's sofa under the balcony. 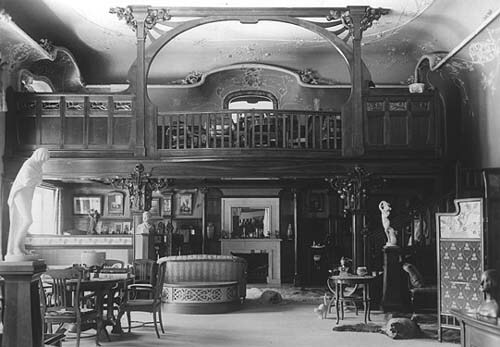 The maplewood used in the construction was a special variety which, it was said, required seven years immersion in water in order to be worked and shaped in the serpentine fashion of Art Nouveau. Maplewood was the preferred wood of many art nouveau furniture artists. Its' hard grain was a challange to carve, but the wood took on a deep sensual glow when polished - shining like dull matte gold. The wood was also very strong and thin supports could be produced which were quite durable. Large quanities of it were used in this room for the furnishings and it was of course the source of the room's name. Beneath the balcony were two cosy sitting areas separated by a fireplace set with ceramic tiles. 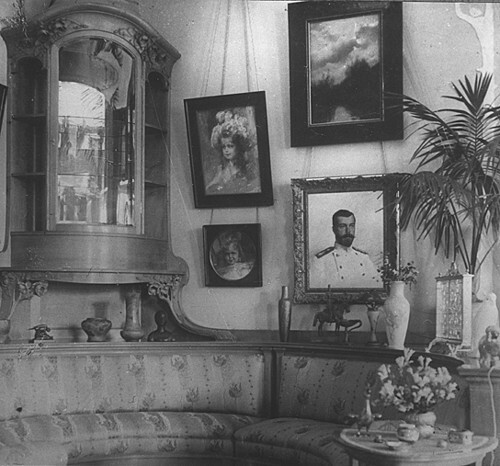 The Empress had an Art Nouveau chaise lounge under the balcony nearest the window, directly behind huge planters where fragrant flowers in pots were situated. On the opposite side beneath the balcony was a sitting area for her children, where they could work and play while the Empress read or worked at needlework nearby. Above the banquettes were shelves for small vases and collectables. Bearskin rugs sprawled across thick and luxurious gray-green castor carpet which was sewn in strips. The bearskin rugs were left-overs from the old Music Room, which had formerly occupied the space where the Maple Room and New Study now stood. These were great play-toys for the children when they were small. Left: The corner cabinet, from a photo taken in the 1930's. The centerpiece of the room was a great built-in maplewood cabinet in the left corner closest to the Pallisander Room. In the original design for the room this space was designed for a corner heating stove. It was Alexandra's idea to eliminate the stove - which was useless given that central heat was now used in this part of the palace - and she had a part in the design of the cabinet. This was the place where the Empress kept many of her famous Fabergé eggs. The cabinet was rather high up and somewhat hard to get at - thus a safe place to store delicate items. It rose above a curved cozy corner covered in Darmstadt fabrics - this which was a favorite place for family teas. Along the backs of the curved sofa was a wide ledge, where many of the Empress's favorite things were displayed. Here, in a glass and silver cabinet placed so that light shown through it, Alexandra kept a collection of animals carved from hardstones. Alongside the cabinet were vases of flowers, bronzes and other small things. Each one of the Empress's private rooms had a spot of special sentimental family value to her, where she placed unique things of personal importance. This 'sanctification' of spaces in her rooms symbolised the paramont place that family played in her life and the way it intertwined with her relationship with God. On either side of the maplewood cabinet the Empress chose to place her favorite pictures of her family. Here were four pastels of her girls and an early painting of Nicholas in naval uniform. These pictures of the Grand Duchesses were by the fashionable Munich painter, Kaulbach. They followed the family into exile in Siberia in 1917 and some returned to the palace after the murder of the Romanovs. Later they were sold by the Soviet Government to finance the clandestine Soviet sponsorship of foreign communist and leftist parties during the 30's. These pictures ultimately passed through the antique dealer A La Vieille Russie in New York in the 1940's and their whereabouts are now lost. The Maple Room had many sculptures; among them were busts on plinths of Aleksey and Alexandra's brother Ernst-Ludwig, a marble lifesized sculpture of the infant Tatiana and gilt bronze Art Nouveau works. Religious themed-bronzes represented veiled women or women in attitudes of prayer. Other works in marble and bronze follow eclectic themes, the signs of an unplanned collection assembled over time through personal taste and foreign travel. There were other art works as well - gorgeous pastels by Kaulbach of Alexandra's sister Elizabeth and one of Ernst-Ludwig by Adolph Beyer from 1906 - and delicate watercolors by the Russian artists Elizabeth Bem and Solomko. Alongside them were prints of sentimental works which pleased the Empress, but were deemed in 'bad taste' by her many critics. The huge windows of the room were hung in rich Darmstadt fabrics and delicate lace curtains. A door in one of the windows lead out onto the Empress's famous iron balcony, which was one of many balconies attached to the palace. 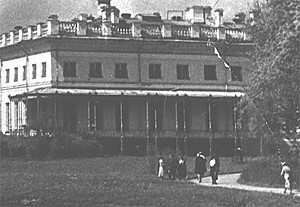 This one was built by Danini in 1895 as a part of the remodelling of the palace in preparation for Nicholas and Alexandra's residence here. The balcony was a favorite place for the Empress and her family year-round, even in winter. Meals and teas were often served here on tables laiden with masses of fragrant flowers on fine tablecloths with china, silver and crystal. Hand-inscribed menus on heavily engraved stock with Imperial double-eagles were placed at each setting. Heavy curtains decorated with a greek fret pattern were hung between the columns of the balcony to provide protection from sun or bad weather. During WWI electric lighting was installed on the balcony so that the family could remain here at night. The wicker furniture often used on the balcony was made by injured soldiers.